Hive and Honey Rooftop Bar Now Open! 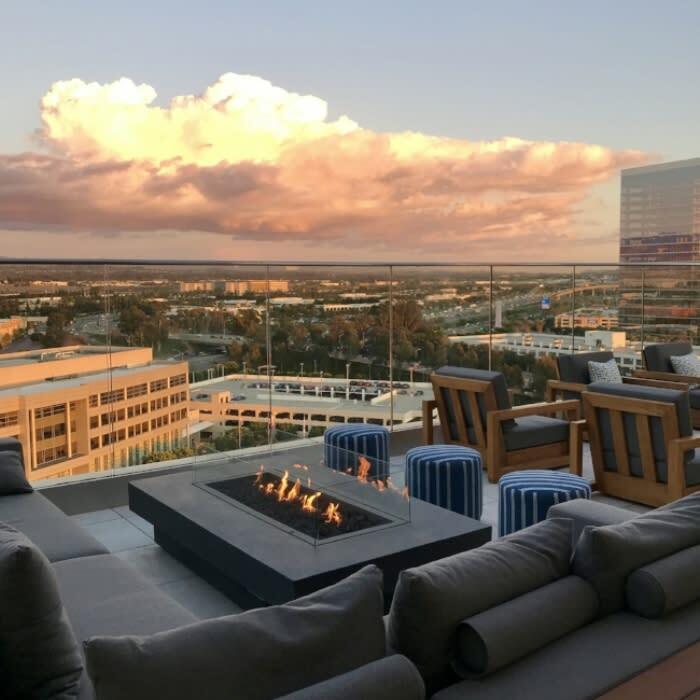 Irvine’s most anticipated new nightspot is now open and is taking its place at the very top. 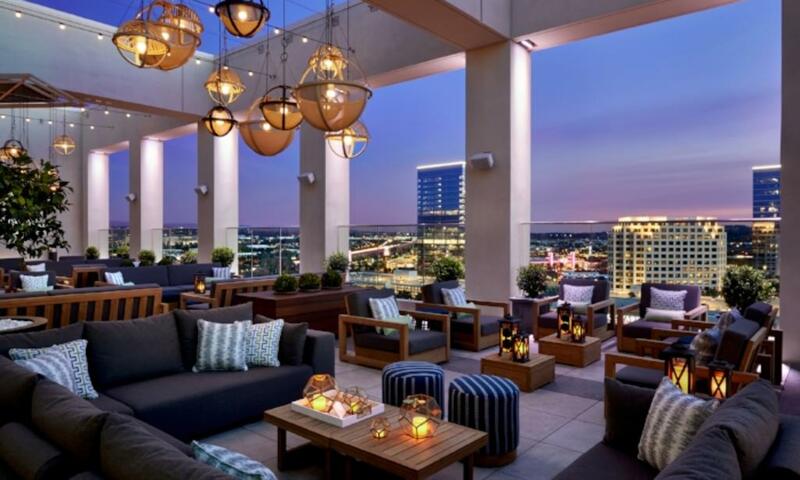 Towering above the Irvine Spectrum Area, the new Marriott Irvine Spectrum offers 15 floors of elevated innovation and style. Now, Hive and Honey rooftop bar takes guests even higher. The 16th-floor rooftop is destined to be the hotspot for spectacular views of sunsets and city lights. Visitors will get a breathtaking first impression of the city skyline, and long-time locals will get a fresh look at their hometown. This lofty perspective of Orange County is a rare one. Hive and Honey guests can now enjoy a view once reserved for pilots at the old El Toro Marine base, now the Orange County Great Park. 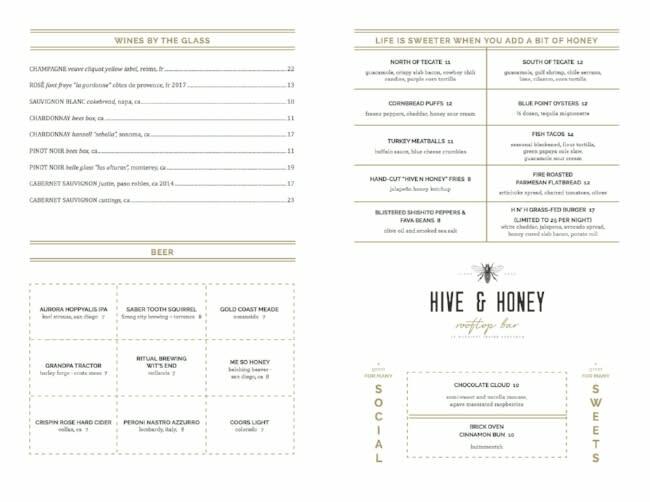 Like most of the public spaces in Marriott Irvine Spectrum, Hive and Honey gets its inspiration from local produce and the beekeeping industry that once thrived here. 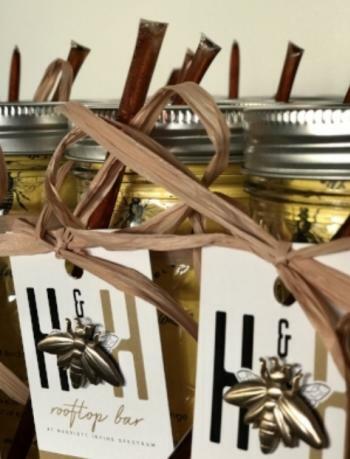 Founding settlers of Orange County’s canyon communities were beekeepers, and remnants of that history still lives on in the foothills that are part of the rooftop’s view. Try an H&H Old Fashioned, with honey-infused whiskey, or a Honey-San cocktail, made with Japanese whiskey and ginger honey syrup. 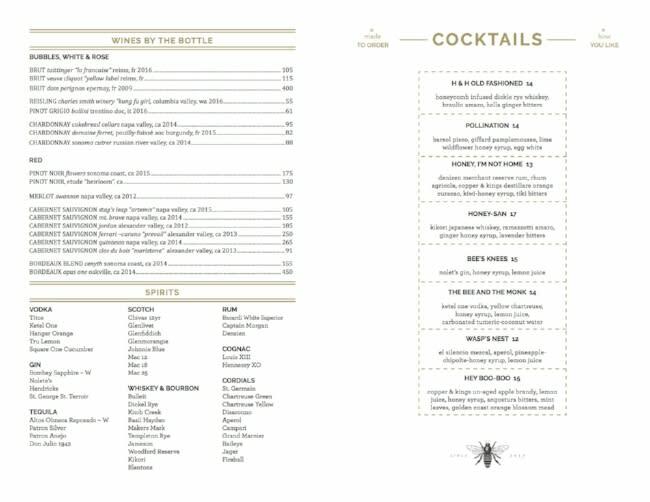 Or taste Hive and Honey’s signature cocktail, The Bee’s Knees. 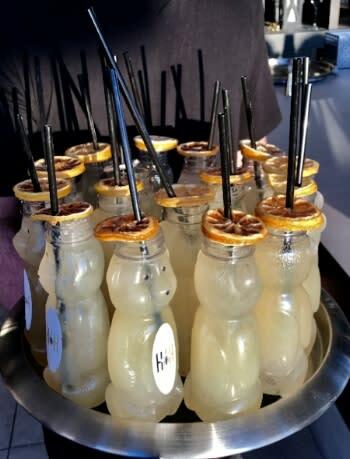 Nolet’s Gin, honey syrup and lemon juice..served in a cute, honey bear bottle! 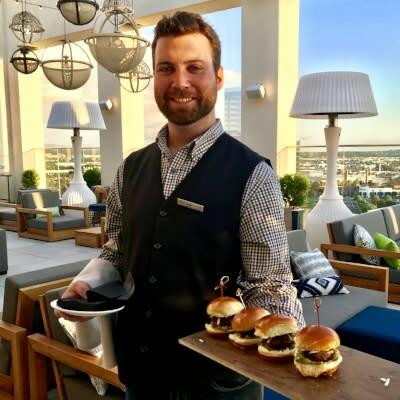 Local craft beers and artisan cocktails are paired with tapas-styled bites created by Chef Paolo Buffa. Maybe share a plate of hand-cut, Hive and Honey fries…with jalapeño honey ketchup of course! Arrive early for a bite of exclusivity. The signature grass-fed burger will go fast- only 25 of these specialty burgers will be available each night. …You need to get up on the roof.